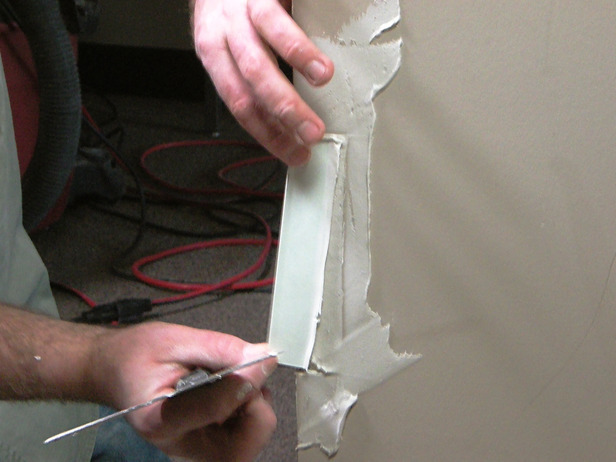 If you have a dented corner bead, we'll teach you how to fix it up. Cut above and below the damaged piece of corner bead. Make sure you go through it. Cut along both sides of the corner bead with a utility knife, and pry off the damaged piece. Then use metal snips to cut out a new piece of bead the same length. Add a layer of joint compound, then press the new piece of corner bead on. Then when it's in place correctly, add a final layer of joint compound. Once it has dried, sand and paint.